East West Link Defeats the One Thing it was meant to serve: INDUSTRY! If there was ever an ironic moment East West Link would be it. Hewison said TOES, the Rethink East-West Link Society and the Manukau Harbour Restoration Society supported the idea of an east-west connection in principle but not the proposal by the New Zealand Transport Agency, especially the elevated interchange structure at the Onehunga-Neilson St end. He said NZTA made it clear the east-west link is not a motorway and likened the Mangere Inlet section to Ponsonby Rd and not a big ugly motorway. 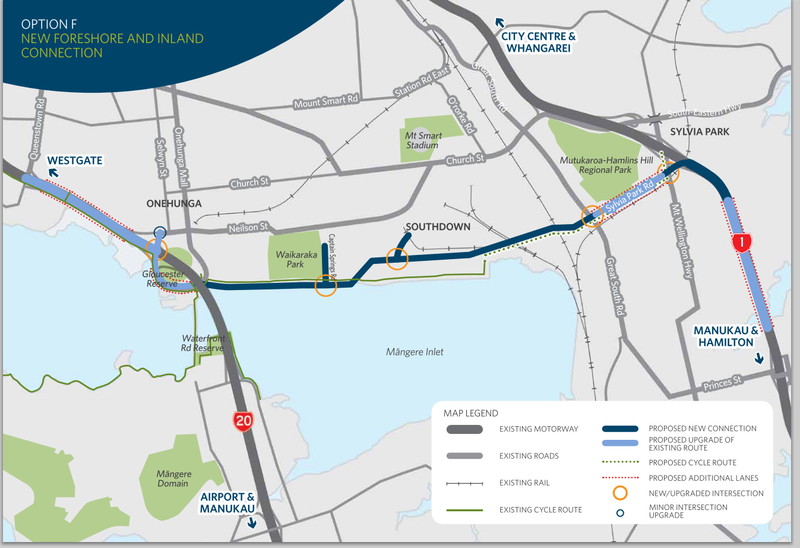 “Perhaps a closer analogy than Ponsonby Rd is that this section of the east-west link will become the ‘Tamaki Drive’ of the Mangere Inlet, especially with its extensive reclamations, attractive cycling and walking routes, and uninterrupted views of the harbour,” Hewison said. This could seriously undermine the current industrial uses of the area inland from the road and encourage the development of housing and retail activities. “These retail and residential pressures on industrial land are already truly underway. The Auckland Unitary Plan independent hearings panel said they expected most heavy industry will migrate over time to the periphery of the city,” Hewison said. For all the benefits East West Link is meant to offer including beautifying the Mangere Inlet foreshore the East West Link kills the very thing it was meant to serve – heavy industry! I have already blogged in the past that the Onehunga/Southdown industrial complex is facing pressures from residential and commercial as the Isthmus continues to intensify. Council apart from Deputy Mayor Cashmore certainly didn’t believe me but the Unitary Plan Independent Hearings Panel knew it was going to happen. As land values go up from encroaching residential and commercial land use demand industry shifts to the fringes where land is cheaper and competition from other uses is less. 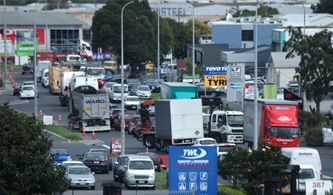 It will mean Onehunga/Southdown will decamp to places like Wiri, Takanini and Drury South. This is natural within a city and no amount of business land studies and preservation will stop it. Option B gives you an arterial and transit spine between SH20 and SH1/South Eastern Highway Interchange with new ramps bypassing Mt Wellington and Sylvia Park. Option B for the price of around $600m and a BCR of around 2.4 does not harm current industrial land use (it helps it as it slowly decamps) and when it does happen it will help the new residential and commercial that will replace the industry over the next thirty years. So it becomes rather ironic that Option F touted as serving industry will essentially serve as its death knell (sped up) leaving the expressway as very expensive stranded asset. Probably why advice from NZTA, Joyce and the Trucking Lobby should be taken with a grain of salt.